For today, we are going to feature “Best Cyclocross Dismount or Remount” at this year’s Tour of California. So far, we have two nominees for the award. The aforementioned Jeremy Powers (Jelly Belly), who managed to jettison his bike in the pile-up that bloodied Armstrong, and hop over bodies and bikes without going down. The second nominee is Peter Sagan (Liquigas-Doimo), who went down on Stage Three. Sagan hit the deck, rolled once, got up, grabbed his bike and executed a beautiful running remount. Sagan did this on a climb and did not lose his spot at the front of the field. Those are your nominees. Tell us via comment or Tweet to @CXHairs who should take the prize. As for the GC standings, Tejay Van Garderen had a good day moving up to third in the CX race. Sagan, by winning the stage, moved into a big lead on points. Powers picked up some second place sprint points as well. This is the 2nd time I’ve heard about Sagan’s remount; anybody have a link to some video or a highlight reel? 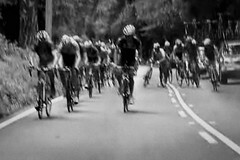 check out stage three highlights on the versus.com video page. aren’t the jaque maynes bros in TOC as well?